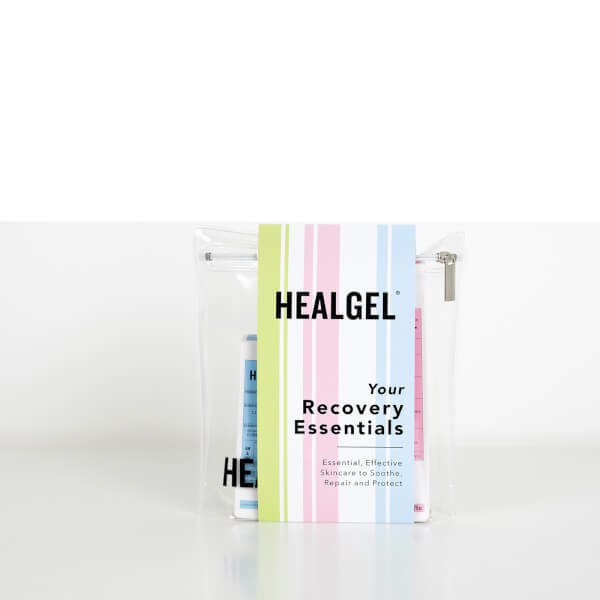 Repair and replenish sensitive skin with the HealGel Your Recovery Essentials Set; a three-piece kit of the brand’s best-selling treatments that utilise scientific developments to restore and rescue skin from tip to toe. Suitable for all skin types, the trio work in synergy to soothe, correct and protect your skin to leave it feeling healthy and rejuvenated. Perfect for skin that's prone to irritation and sensitivity, including dryness, redness and discolouration. An anti-ageing rescue formula that delivers a plumping and revitalising effect and works to replenish, firm and smooth the skin for a younger look and feel. Formulated with omega and seed oils with a unique triple phase Hyaluronic Acid complex for an instant plumping effect, this serum also works to re-hydrate whilst restoring elasticity. Also containing Arnica and Madecassoside, suspended in liposomes with powerful peptides and biodynes to instantly soothe, HealGel Face will leave the skin soft and supple. An advanced corrective formula designed to condition and lift the delicate eye area whilst reducing dark circles and puffiness. Also acting as a perfect base for make-up, it's a must have product. 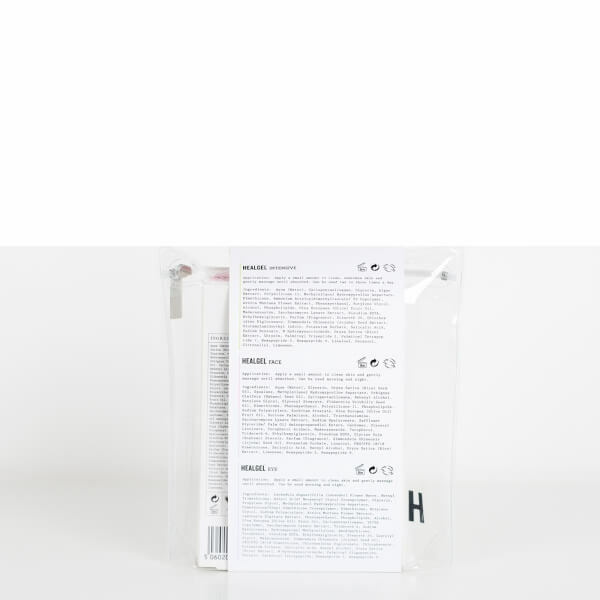 It contains a dual action hyaluronic acid complex that locks moisture deeper into the skin and firms the eye contours, whilst other collagen-boosting active ingredients such as liposomes with powerful peptides and biodynes soothe the skin. The effect is to soften the appearance of fine lines, even skin tone and improve elasticity through intense hydration. A topical skin treatment created by a team of cosmetic surgeons. The weightless, aqueous gel melts into the complexion to start supporting the skin at a cellular level, strengthening the natural barrier function to protect against free radicals and other environmental stressors. Enriched with Arnica to soothe any irritation, the serum provides instant relief whilst helping to prevent future dehydration and damage. Expect calm, comfortable and healthy-looking results. Face: Apply a small amount to clean skin & gently massage until absorbed. AM or PM. Eye: Apply a small amount to clean skin & gently massage until absorbed. AM or PM. Intensive: Apply a small amount to clean skin & gently massage until absorbed. 2-3 times a day, AM or PM. Face: Aqua (Water), Glycerin, Oryza Sativa (Rice) Germ Oil, Squalane, Methylsilanol Hydroxyproline Aspartate, Orbignya Oleifera (Babasu) Seed Oil, Cyclopentasiloxane, Behenyl Alcohol, Butylene Glycol, Glyceryl Stearate, Plukenetia Volubilis Seed Oil, Dimethicone, Phenoxyethanol, Polysilicone-11, Phospholipids, Sodium Polyacrylate, Sorbitan Stearate, Olea Europea (Olive Oil) Fruit Oil, Sucrose Palmitate, Alcohol, Triethanolamine, Saccharomyces Lysate Extract, Sodium Hyaluronate, Safflower Glyceride/ Palm Oil Aminopropanediol Esters, Carbomer, Glyceryl Linoleate, Tocopherol Acidate, Madecassoside, Tocopherol, Trideceth-6, Ethylhexylglycerin, Disodium EDTA, Glycine Soja (Soybean) Sterols, Parfum (Fragrance), Simmondsia Chinensis (Jojoba) Seed Oil, Potassium Sorbate, Linalool, PEG/PPG-18/18 Dimethicone, Salicylic Acid, Benzyl Alcohol, Oryza Sativa (Rice) Extract, Limonene, Hexapeptide-3, Hexapeptide-9. Eye: Lavandula Angustifolia (Lavender) Flower Water, Methyl Trimethicone, Adipic Acid/ Neopentyl Glycol Crosspolymer, Glycerin, Propylene Glycol, Methylsilanol Hydroxyproline Aspartate, Dimethicone/Vinyl Dimethicone Crosspolymer, Dimethicone, Butylene Glycol, Sodium Polyacrylate, Arnica Montana Flower Extract, Laminaria Digitata Extract, Phenoxyethanol, Phospholipids, Alcohol, Olea Europea (Olive Oil) Fruit Oil, Cyclopentasiloxane, VP/VA Copolymer, Saccharomyces Lysate Extract, Trideceth-6, Sodium Hyaluronate, Hydroxypropyl Methycellulose, Amodimethicone, Tocopherol, Disodium EDTA, Ethylhexylglycerin, Steareth-20, Caprylyl Glycol, Madecassoside, Simmondsia Chinensis (Jojoba) Seed Oil, PEG/PPG-18/18 Dimethicone, Chlorhexidine Digluconate, Chlorphenesin, Potassium Sorbate, Salicylic Acid, Benzyl Alcohol, Oryza Sativa (Rice) Extract, N-Hydroxysuccinimide, Palmitoyl Oligopeptide, Chrysin, Palmitoyl Tetrapeptide, Hexapeptide-3, Hexapeptide-9. Intensive: Aqua (Water), Cyclopentasiloxane, Glycerin, Algae Extract, Polysilicone-11, Methylsilanol Hydroxyproline Aspartate, Dimethicone, Ammonium Acryloyldimethyltaurate/ VP Copolymer, Arnica Montana Flower Extract, Phenoxyethanol, Butylene Glycol, Alcohol, Phospholipids, Olea Europaea (Olive) Fruit Oil, Madecassoside, Saccharomyces Lysate Extract, Disodium EDTA, Ethylhexylglycerin, Parfum (Fragrance), Steareth-20, Chlorhexidine Digluconate, Simmondsia Chinensis (Jojoba) Seed Extract, Glutamylamidoethyl Indole, Potassium Sorbate, Salicylic Acid, Sodium Benzoate, N-Hydroxysuccinimide, Oryza Sativa (Rice) Extract, Chrysin, Palmitoyl Tripeptide-1, Palmitoyl Tetrapeptide-7, Hexapeptide-3, Hexapeptide-9, Linalool, Geraniol, Citronellol, Limonene.